The first time I heard this song played in the streets of Taipei I was so excited to discover that Taiwan, like so many American neighborhoods, had ice cream trucks! What a fun way to practice ordering in Chinese! I promptly walked across the hall in my dorm to ask if anyone else wanted to get their 50 Kuais out and order some with me. I’ve been trying to catch this clip ever since I first heard it but was never prepared in time to catch it! I finally got this video clip in Hualien this weekend (a county on the east coat of Taiwan famous for its scenery)—it turns out Taipei City isn’t the only area that uses this system! If you ever come to Taipei you will, with out a doubt, hear the trucks—don’t expect any ice cream! That is an interesting cultural difference. It is not a leave and forget situation. Cool post on an aspect of another country that is always interesting (at least for me) to learn about. Wow! That must have been so disappointing. It’s really funny how associations we have from home can completely change after spending time in another country! I doubt you’ll feel tempted by ice cream trucks once you’re back home. One of the things that I have been thinking about lately is being uncomfortable. I have become comfortable here in Vietnam but there are moments when I am shaken by something I observe or something that is said. It can be as simple as learning that I can wander the city by myself, get lost for a while in the busy streets and meander my way back to an area that I know. There are some things that I will never get used to. I will never be accustomed to people throwing trash into the streets, or urinating in public. There are some cultural differences that I consider to be abrasive and learning how to respond effectively, so that I will neither offend nor feel poorly myself is an important skill to be developing. I was having dinner with some of my American study abroad group members as well as some of our roommates and three of their friends whom we had not yet met. We were getting to know the Vietnamese students, finding out what they study and what they like to do outside of school. They asked if we had boyfriends and we were answering. I was the only girl in the group with a boyfriend, so the Vietnamese students were trying to figure out why my friends weren’t in relationships. One of the Vietnamese guys, then made a comment about women needing to be in a relationship because even a weak man can protect them. I found this comment offensive, and understanding that Vietnamese culture tends to be very sexist I contained, what in the states would have been a scalding rebuke, and calmly asked him, “why does a woman needs a man to protect her and why would even a weak man be stronger than any woman?” He looked at me and smiled. I then heard one of my American friends say under her breath, “Wow this is not the time.” I was confused but let the conversation turn to other topics without an answer to my question. I wanted to know why my friend said that, so after dinner when we were walking back I asked them and they said, “it just was not the right time to be challenging the cultural norms when we were just meeting them.” Then they got defensive and walked away. I still believe that I was not challenging his beliefs by simply asking him about them. I did not say that he was wrong but only wanted to know why he thought women should be in a relationship and not be single. I wanted to know more about how Vietnamese people, as old as myself, view romantic relationships. 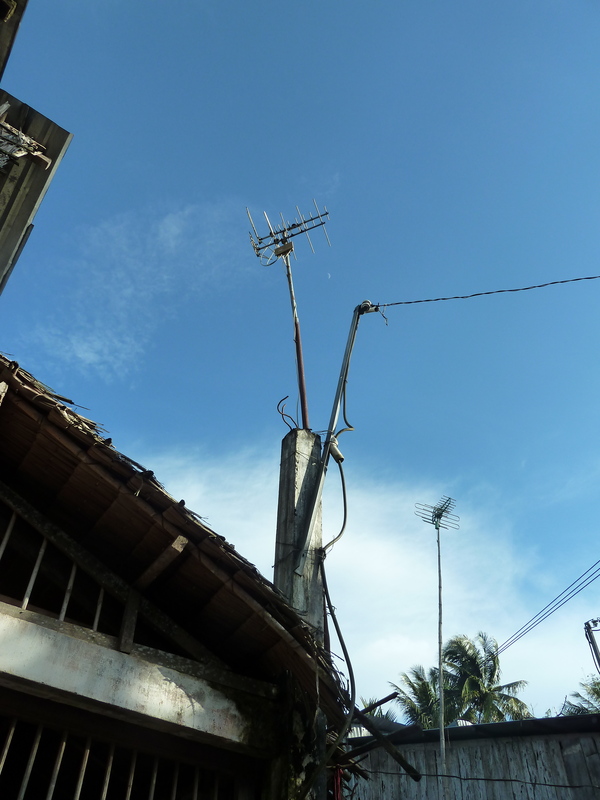 This is why I came to Vietnam, to gain an understanding that I would not be able to, if I were to travel here on my own and for a shorter period of time. We are here to be immersed in the culture, I understand that asking questions and having discussions can be uncomfortable because it is those conversations that I find to be the most valuable. So when is it the right time to ask someone a question? Do I wait, like my friend suggested, until I know them better, to bring up the topic? I do not think I acted in a way that was offensive, I believe that it is best to ask the question when the topic is brought up naturally. If I had not said anything I would have felt more upset being left without a reason for such a statement. I don’t believe that in many of these cases that there is going to be a “right time,” if the question is controversial, no matter when you ask, people may feel uncomfortable at first but that does not mean that the questions should not be asked. I think it would be even more accusatory if I had waited for another time and asked randomly “so what are your views about the roles of men and women in a relationship?” Or if I had waited for an issue or problem to arise, so I would have to confront him directly, because of a comment that he made about me or someone else that I felt was demeaning or just plain rude. So this is one of the important issues that I have been mulling over. Let me know what you think. Have you had any similar experiences while traveling abroad? Thanks so much for posting this, it’s very well written and thought provoking. There are no easy answers to your questions. Interhuman relations in the same culture are complex enough, let along putting a language and context between people. I think you handled the situation with thoughtfulness and care. If you met someone in the US with such attitudes, you wouldn’t pause over cultural considerations or because you just met them, necessarily. Why would it be different suddenly? This is the hard thing, balancing relativism and our innate sense of right and wrong. But I think that’s okay, cross-cultural dialogue is not always going to be smooth sailing. If it was, I don’t think either side would learn much. 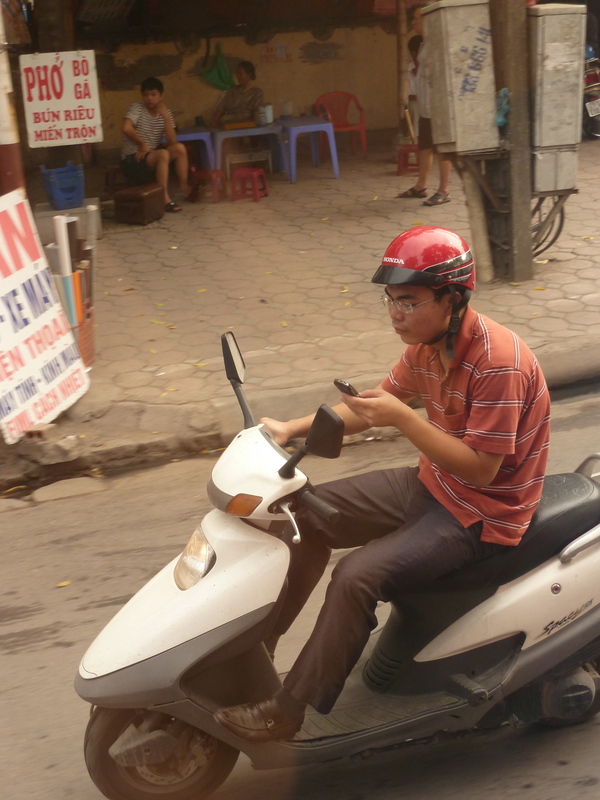 You’re not there to become Vietnamese, but better understand both the cultural context and the individual variations. And understanding often takes questioning or even challenging. What will the dissonance you provide as you refuse to go along with sexist ideas going to accomplish? Hard to know, but it might have been the first time anyone disagreed with the guy in question. Who knows if that will make him think…Anyway, thanks again for the post, it’s a great window into what it’s like to truly cross cultures! So glad to hear you post this! On one hand, it’s certainly interesting to hear of the differences in ways of thinking about the roles of men and women in the family, society, and relationships. But I, like you, can’t get past being uncomfortable with certain “norms.” On the same subject, I’ve been told matter-of-factly that Taiwanese men are simply uninterested in and not attracted to “western women.” The reason for this being they are considered too independent, too stronger willed… at least that is the way it’s been put to me. I think your question was appropriate. It doesn’t sound like an attack, it sounds like an inquiry—simply a means for you understand a way of thinking a little better. I actually would have like to hear their answers! Hello world I sincerely apologize for the absence of my blogs. I will promise to keep posting on a weekly basis. So far my journey in Vietnam has been such a beautiful and enriching experience. Vietnam is a country deep rooted in folklore and spiritual energy. Personally I have always been attracted to the mystical and spiritual side of the world. The Vietnamese are strong believers of good fortune and good luck and that is why they have shrines in their houses and stores. The shrines are suppose to bring good luck and also avoid the presence of evil. 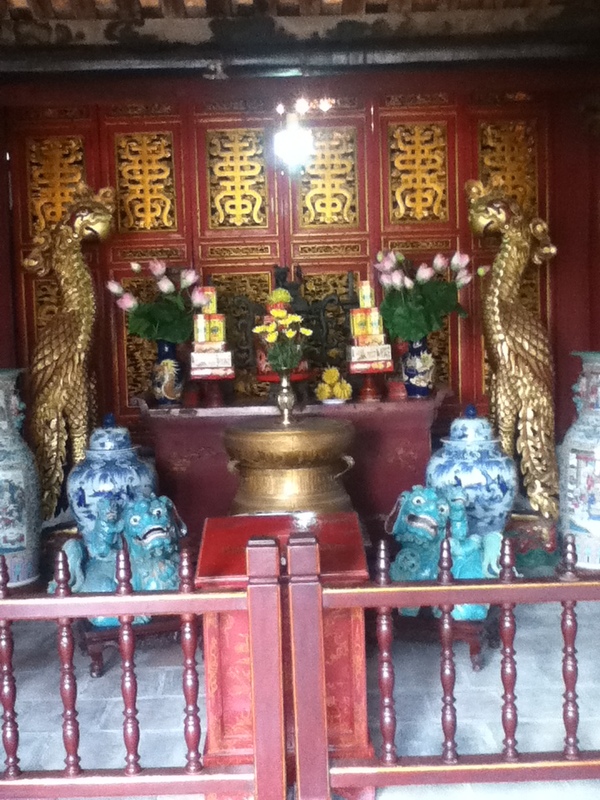 The picture below shows as shrine inside a temple. Most people pray to the shine and wish for good grades, good fortune, and good health. I hope my prayers for good grades have kicked in! 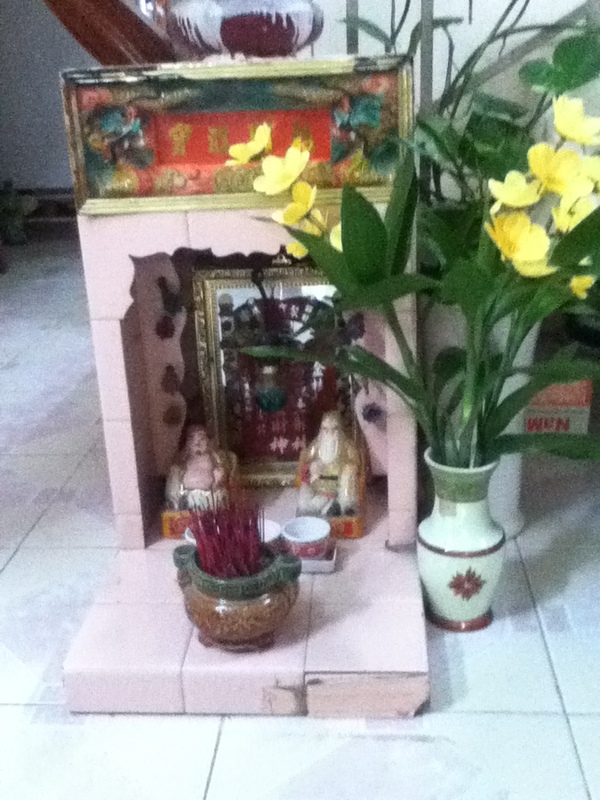 This picture is the shrine inside the house of a Vietnamese buddy. Her family’s hospitality was amazing and the food was delicious. I have to warn you that before you guys judge this meal was probably one of the best that I have ever had. Although this is not a picture of a shrine it is meal eaten only at the end of the year because it is suppose to bring good luck. However if you eat it at the beginning of the year you will receive bad luck. Can anyone tell what it is yet? 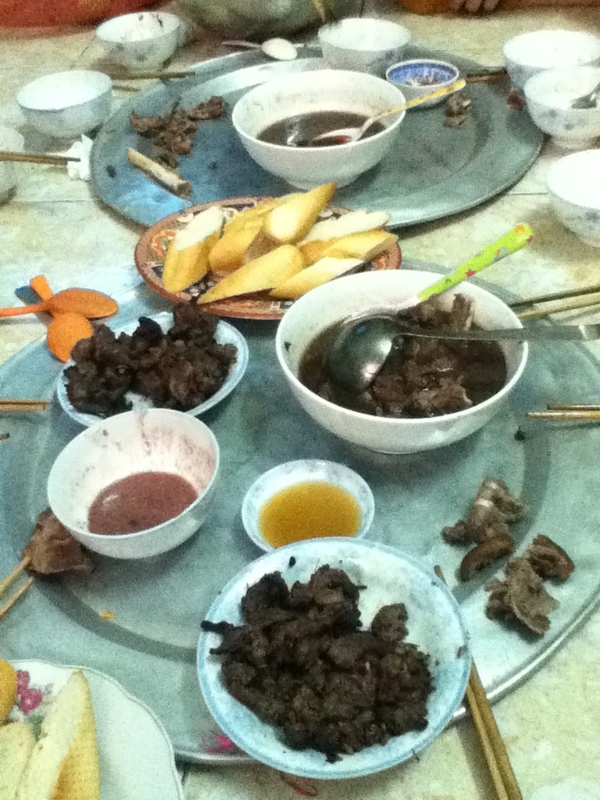 It is dog meat! Yum. 10) Window blinds. They are completely necessary, especially when the sun rises at 6 am. Every. Single. Day. 16) The most amazing food ever! I love being a minority. I know what you’re thinking: I’m a white, American girl. How could I possibly be a minority? In Japan, I probably stick out the most. Blonde hair and pale skin doesn’t exactly blend in too well with the Japanese. But I don’t actually mind. I don’t care that I’m stared at when I’m waiting for the train at the station, or when I’m sitting with a bunch of people at a restaurant. I see people’s sideways glances as I pass them on my bike, and watch as little kids point my way as I walk up and down the aisles at the market. I’ve also found that I value not knowing the language that I’m currently submersed in. I like looking at signs, mostly in かんじ (kanji), and not knowing what is being said or advertised, and walking by people and not understanding everything they’re saying. Even when they try and speak with me, their Japanese words sometimes all running together in ways I can barely comprehend, I still marvel at their native language. 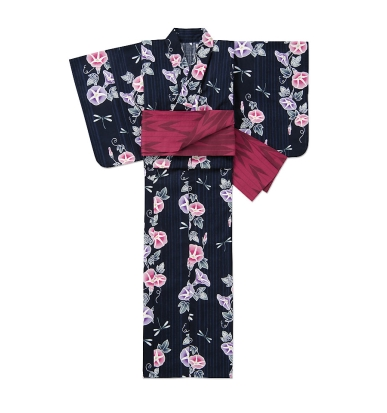 When I finally started my にほんぶよ (Nihon buyo: Japanese traditional dance) lessons, I didn’t really think too far into it. 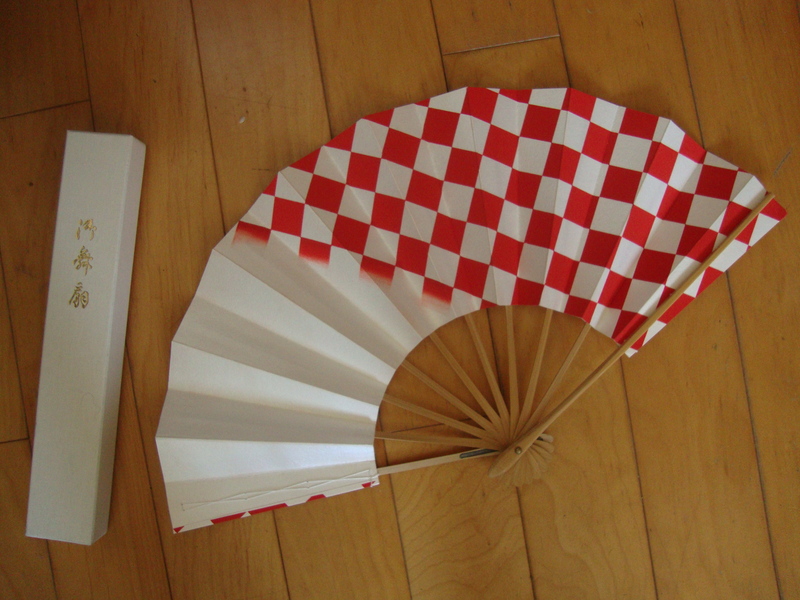 I was excited, of course, to be learning a traditional Japanese art, wear a traditional Japanese ゆかた (yukata) and learn to properly hold a traditional Japanese fan. I somehow forgot that my teacher wouldn’t be speaking English. The first time I visited the りょかん (ryokan: Japanese style inn), I accidentally interrupted my せんせい’s (sensei’s) lunch. Strike one for awkwardness. Strike two for staring in awe as my teacher and her other students spoke to me in rapid Japanese. Strike three for growing up in America and being too embarrassed to dress in the traditional garments in front of the other women. I deserved to be laughed at after that one. I soon discovered that it’s relatively difficult to learn a dance with head movements and tilts while still watching the teacher. Yes, she was (I’m assuming) saying aloud the movements we were supposed to make, but all I could pick up was the occasional ひだり (left) and みぎ (right). My せんせい took to prodding my head in various ways and pushing my legs and arms into their proper positions rather than merely saying what I should be doing. Her encouragement was appreciated. While it’s still hard to learn the dance moves without vocal instructions, I’ve found I prefer it this way. They don’t seem to mind my minimal vocabulary, or my obscure hand gestures when asking a question. In turn, I actually enjoy watching them laugh at my mistakes and smile when I finally get something right or understand what they’re saying. To me, being different here is good; it’s a learning experience. I’m still able to understand people and create friendships despite the incredible language barrier. And I wouldn’t have it any other way.